Members 1st New Jersey FCU is a member of the CO-OP Shared Branch SM network. The network includes over 5,000 credit unions and self service locations where you can access your accounts and conduct many of the same transactions you do at our Vineland, Woodstown, or Bridgeton credit union locations. For example, you can apply for loans, make cash withdrawals and verify account balances. And that’s only some of the services available. It’s the perfect solution anytime you are away from home. 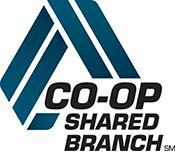 To locate a CO-OP Shared Branch SM location wherever you go, simply use the online locator. As a member of the CO-OP ATMSM network, you have access to surcharge-free ATMs. You can locate no fee ATMs nationwide using your computer − plus download their free mobile apps for Android and Apple® cell phones and tablets. Click here to download the CO-OP ATMSM app. Members 1st NJ is also a member of the NYCE® ATM network. Click here to download the NYCE® ATM app. If your immediate family did not join Members 1st because there were no convenient branch offices where they live, let them know they can now join and access their Members 1st accounts at any CO-OP Shared Branch SM location nationwide. It’s the convenience they need to enjoy the many money saving benefits at Members 1st. Invite them to become a member today!